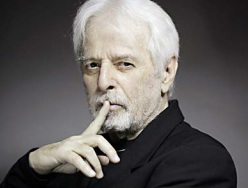 Known above all as a film and theater director, Alejandro Jodorowsky (Chile, 1929) began by working in the circus and with marionettes. In 1962, with Fernando Arrabal and Roland Topor, he founded the Theater of Panic in Paris, where they staged many happenings. His films, several of which have achieved cult status, include: Fando y Lis (1969), El Topo (1971), La Montaña sagrada (1973), Tusk (1979), Santa sangre (1989), The Rainbow Thief (1990) and Viaje a Tulún (1994). Not only was he the director, but he also wrote the screenplays, composed the music, and often acted in his films. A noted author of comic books as well, his work includes Aníbal V, in Mexico, and the Inca Azul series with drawings by Moebius in France. Among his several novels, Donde mejor canta un pájaro (1994) offers an exuberant blend of magical realisms, in both the Yiddish and Latin American traditions, transforming his own genealogical tree into a story of myths and fables. The following interview took place during his visit to New York in May, 1995. First, a bit of chronology. When did you first arrive in Paris? I arrived in Paris in 1953, from Chile. I first studied mime there, with Marcel Marceau's teacher, Etienne Decroux. A year later, I entered Marceau's company and I stayed five years. We traveled throughout the world, and I returned to Paris. Then, I also worked in music hall in Paris, I directed Chevalier. I was doing that for two years, it was very successful. After, I left for Mexico. During my stay in Mexico, I returned a number of times to Paris to found the Theater of Panic with Arrabal and Topor, and to do the efímeros (happenings). Then I returned to Mexico. After Mexico I was in New York for two years, and I made The Holy Mountain. Later, I went back to France. And for fifteen years now, I've been living in Paris, in Vincennes. But always traveling. It was always a question of work. I wanted to do mime, and the only school for mime in the 1950s was Marceau's in Paris. And later, I would get calls to do a film or to do theater. In the last fifteen years, I decided to give a conference every Wednesday, to create an individual university which I called Cabaret Místico. It was always full. So, from that moment on I gave tarot classes, I did studies on what I call psychogenealogy---I study the genealogical tree of the person, it's like a collective therapy, psychomagic, they're therapies---I wrote books. And I had quite a large following. So I stayed in Paris because it's always been full there to this day. Where did you do this work? Different places. Sometimes in a school of mime, later for a long time in the university at Jussieu, and now I do it in part of a space I own which is a dojo for karate. How did you advertise it? I never advertise it, since I started, and it's free. At the end people make a collection to pay for the space, like in a church. But it's by word of mouth, there's never been any publicity in fifteen years. Because I decided precisely to show that what people think is necessary, is not. Did Paris signify something special for you before you went? Yes, because in Chile the important thing at that time, in the '40s and '50s, was poetry. There was Neruda, and Huidobro. Vicente Huidobro, his mother had a literary salon in Paris, and he was quite well known there. So all of us Chileans went to Paris as to the literary center of the world and of poetry. It was a myth. So, of course I went to Paris for that. Did you meet Huidobro when you were young? No, Huidobro was already dead when I started in literature. I met Neruda, Nicanor Parra, in Chile. They were my masters in poetry. And Enrique Lihn, he was a great friend and my teacher, a great poet. When you arrived in Paris for the first time, did it correspond to your image of the place? It was terrifying, because Chile is a small place and also I came without much money. And I arrived without speaking a word of French. The first day I ate a sandwich jambon, and then in the market I would point with my finger to the fruit I wanted. I learned French in the street, see. So Paris was very impressive, it still is. For a while I think New York was more powerful culturally, probably in the '80s or the '70s it was, but not anymore, Paris has a tremendous cultural development at this point. When you arrived in '53, whom did you know? When I arrived, existentialism was going on, and since I'm an explorer I really got involved with the last remnants of the existentialists, this was before hippies. I was really in contact with the existentialist core, people who were like the punks of that time. By chance. They'd be walking around Saint Germain des Près. There was a Chilean, who went about doped up on something called élixir parégorique. Paregoric was for diarrhea, it had a lot of opium. So he would buy medicines and take them by the liter. You can imagine the kind of person he was. So, he introduced me to that group, which I didn't belong to because you had to get drunk and high all day long. It wasn't for me, I was a mime, it was no help to me. But it was the first type of people I met in Paris. That is, people who must be legends now. After, I thought to go over to the Rue Cujas by the Sorbonne, where the great myth of the Sorbonne was Gaston Bachelard. It was very interesting meeting him. And in the same street, the poet Nicolás Guillén lived in exile, for example. You could run into him every day, or Violeta Parra, the singer, she was a friend of mine. They were the intellectuals who had been expelled from their countries. That was in '53, '55, up into the '60s. There was a place called L'Escale, on Rue Monsieur le Prince, where everyone went to dance and especially to meet French girls who liked South Americans. The only place where you could get yourself a French girl. We'd be there all night long. Latin Americans would come from all over to sing there, later the songs became quite famous. Were you looking to be with Latin Americans, or did you try to meet French people as well? I'd end up with cases like El Greco, who was Argentine, he committed suicide writing the word fin in his own blood. He was one of the first conceptual artists, he filmed people in the street, he did a show where there were only white canvases . . . I met people like that. It was hard to meet French people. There was a big rejection from the French. So, I was making friends with Latin Americans. I knew Marceau, of course, that was something else, and by way of him I managed to step outside of the Latin American world. What was your first encounter with André Breton? I arrived in Paris around one in the morning, and from a café on Saint Germain called the Old Navy, I called him. I said, I've just arrived. He asked me who I was. I said, Jodorowsky. He said, Who is Jodorowsky? I told him, A young man of twenty-four and I've come to revive surrealism, here I am. I want to see you. So he said, Come tomorrow, it's very late. I said, No, now. He insisted no, so I told him, It's not surrealist of you to not see me, so it shall never be, and I hung up. Years later, we became friends. But it was pitiful, I found myself with an old invalid. He was like a great puritanical functionary by the '60s. Did you consider your experience after Chile as exile? In Chile I was doing fine, but I reached a point where I couldn't learn anything more. So I took a boat and never returned. I broke off. No one threw me out. So I never felt myself an exile, I could return whenever I wanted. But I did feel myself a foreigner throughout the world. That is, I left Chile in '53, and I returned in '90. Did you keep in touch with family there? I left my family, I broke off with them. I would never see anyone again. I broke off with everything. It was like death. It was something else over there. There were never encounters with such people when they came to Paris? Yes, there was, I could see them. But it wasn't important. Why did you break things off like that? For personal reasons? It was metaphysical. I wanted to live without roots. I wanted to have an imagination without limits. I didn't want to have a nationality. In your work as a writer you were already writing poetry as an adolescent, and later you did a lot of theater. But when did you start writing novels, was it much later? Always, but I didn't publish. I started publishing in Chile in '90, because they offered it to me. In Chile I was immediately a best-seller. But what is it to be a best-seller in Chile? And in the last three years, I've started to be translated. So, one could say I'm just starting. And when did you start as a director, rather young? Yes, I directed marionettes. I was already quite well known in Chile. A question about scandal, which you rather seem to like. Where did your taste for scandal come from? Every artist wants to be well known. When one is not well known, a scandal is marvelous because everyone knows you. At the same time, it's very hard. Scandal provokes censure, so you have to be able to put up with that. Scandal followed me, I never sought it out. Like in Mexico: I'd make a film, it caused a scandal; I'd do a play, it caused a scandal. Because of the limits of the country. Because the society wasn't ready. Did having that reputation in Mexico pose certain limits? A lot. There came a moment when I left. Because they threatened me and my family with death. After, I returned. But scandal in Mexico is not the same thing as scandal in Paris. Because Mexicans like it. They adore scandal. The whole country takes an interest, the tabloids . . . Scandal in Mexico is a tradition. And it's not like that in France? No, it's very difficult to cause a scandal in France. In Spain as well, it's difficult. But the two are different. In France, it's difficult because they're very Cartesian. In Spain, because they have no limits, nothing surprises them anymore. After Franco they did everything, so nothing can surprise them. Arrabal caused a scandal, because he said he'd seen the Virgin Mary. He caused a scandal in reverse, he tried to pass for a saint. Why did you return to Paris fifteen years ago? As always, for reasons of my livelihood. I signed a contract to do a film, which didn't get made, they paid for my trip, my hotel. But then I stayed there after. I never chose Paris, only the first time. How was it returning to Paris? Were things very different? Paris is a city that changes very little. One of the big differences about that city is the outskirts and the new buildings. But Paris itself is always the same. Now, wherever you go in the world today, you find the same change. Everywhere, be it Chile, Argentina, Paris, the only thing people think about is making money. The desire to confirm oneself economically everywhere, while other values count for less now, it's like that with the young and everyone else. But I'm very hopeful. For twenty years it's been like that, twenty years from now it won't be. Things keep changing, it'll be something else. I think the world is going to be more spiritual. Even without having the sense of exile, do you sometimes feel a certain nostalgia as a foreigner? The thing is, I grew up as a foreigner. Look, my father was a Jew who tried to pass for a Russian. My mother was half-Russian, because a Cossack raped her mother, and she tried to pass for a Jew. So, I was Chilean and not Chilean, because I was the son of immigrants. I was trying to pass for a Chilean, but never completely. I was never anything. Therefore, the only exile I know is the exile from myself. Because I was never myself. The nostalgia I would have to get back to myself, what am I? But not what am I as nationality. What am I as a spirit without limits. I have limits. So, each day I try more and more to go toward the anonymous which is precisely the impersonal. To try to be an impersonal person. I don't think in terms of cities now. I think of the planet. I don't think in terms of nationality. I think of human beings. Did you always feel this way? Little by little I tried to. In the beginning when I arrived in Paris, every day I wrote a letter to Chile. For a year, I wrote a letter to a girlfriend every day, telling her my impressions, living it as the great adventure of Paris. Until finally I got tired of it, I didn't write anymore. I told myself, If I write, I don't live . . . But if you ask me, where do I want to die? I don't have a place, for me. The land where I'm going to die is the undertaker where they'll cremate me. Nothing else. I don't need a grave anywhere. Where should they throw my ashes? I don't know, they can eat them or make a cake, I have no desire for my ashes to be scattered anywhere particular. I say it sincerely. When you say to me, what is your nationality? I look deep inside me, and I don't have any. At what point did you come to this feeling? Look, when I was fifteen, I tore up all my photos. In order to not have any memory of myself as a child or anything, and to not get attached to photos. Later, I broke with the country. Later, I'm in France, I left France. Later, I left Mexico. In every place I was going away, I was always escaping. Now I'm at the problem that I don't know anymore who I am, and where I'm going and what I'm going to do. I've got contracts for the next six months. After, I don't know. Now they're translating me as a novelist. I'm a success in France. I'm doing fine. I've always done fine. I'll be successful, they'll publish me. And then what? I'll do another. And then what? I'll do another. And then what? Or I'll do another film. And then what? Connected to the question of where you want to die is the matter of your archives, the work you've done. Where do you think they should be kept? Anywhere, it's all the same. Did you get along well with Latin American writers in Paris? Yes, yes . . . I'd go eat with Jorge Edwards, for example. He's my friend, I've known him since I was a child. I also know García Márquez, I'd eat with him, it was nice. But not a deep friendship . . .
And the fact of doing many different things, did that set you apart? It did set me apart, because society is used to a person only doing one thing. In France, they disparaged Cocteau because he did a lot of things, and yet Cocteau was brilliant. Now they're realizing that Cocteau was brilliant, they're discovering Cocteau. It seems the only one who was permitted to do a lot was Chaplin. So, when you do everything, they say you think you're Chaplin, or you think you're Leonardo da Vinci, those are the two examples. But those are prejudices. I think there shouldn't be limits. They're prejudices that come from having a nationality, or from having a diploma, or from having a label. But it's a mistake.